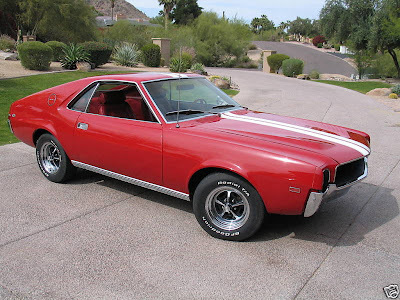 On the list of cars I'd like to own is the AMC AMX. It is just plain amazing that AMC, the smallest of the US automakers in the 60s and perpetually low on cash, could have come up with something this good. The AMX was not built to compete with the Mustangs, Camaros, and Firebirds of the world (that was the Javelin's job), it was meant to compete with the likes of the Corvette. AMC couldn't afford to create an all new design for the AMX so they modified the Javelin's platform and created a 2 seater that was more of a GT style car than a true sports car. While sharing many parts, the AMX is 12" shorter and than the Javelin. Styling, compared to the other muscle cars of the day, is simple, almost European. The AMX is a car that still looks good today. The AMX lasted only 3 years, 1968 - 1970, with less than 20,000 being built. The AMX name became part of the Javelin range in 1971. The car being offered on eBay has just had a "high end driver class restoration" done to it by a longtime AMC "enthusiast" and restorer, using "as much factory original content as possible". The seller states that the engine is a "rebuilt and balanced original 1968 and correct date code 390 engine with factory original style replacement pistons and all new bearings, gaskets and seals". The engine also received a "performance valve job with new valve seals, new guides and hardened exhaust seats" It has a rebuilt Borg Warner automatic transmission. Cosmetically, the red with a white center stripe combination looks great as do the period correct "Magnum 500" wheels and white letter tires. The chrome and paint appear to be perfect. I'd prefer a black interior to go with the red exterior, but the red interior in this car is in nice shape and certainly something that would be easy to get used to. All-in-all, this is about as nice of a "driver" AMX as you'll find. The prices of AMXs have been climbing for the past 4 or 5 years. The NADA Classic Price Guide shows an "average" retail of $28,000.00, with a "high" retail of $41,000.00. Given the amount of work done to this AMX and its overall excellent condition, the asking price of $23,500.00 is very reasonable. The eBay listing has a load of details and some very nice, high quality, pictures. Click here to check it out. Click here to find a Hemmings Motor News article on the AMX. Amx-perience.com has a lot of info on the AMX and related items. I always wanted one of these when I was a kid. Seeing this one makes my remember why. That's a fantastic car. Great post!